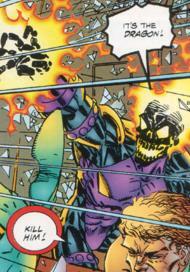 DeathMask was one of the disgruntled members of the Vicious Circle that was recruited by CyberFace when he formed the Annihilators. They sought to seize control of the criminal organisation and following the eventual success of this goal, the Annihilators were folded back into the Vicious Circle. Over the years, DeathMask remained within the Vicious Circle for the years that followed. When Mako gathered together an army of villains to lead against the death-dealing superhero Solar Man, DeathMask was one of those recruited. He was massacred along with almost everyone else present for this assault.